Pirio Kasparov offers to help her friend Ned with his new lobster boat. But the boat is rammed by a freighter and her friend is killed. Pirio, however, survives in the icy water of New England. At first, she figures it's an accident and the ship at fault will be charged. But that's not how it works out. 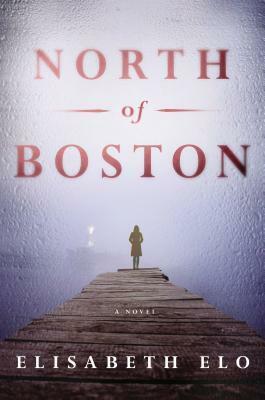 North of Boston by Elisabeth Elo is a suspenseful mystery, but it's so much more. The novel digs deeper into several different topics, including alcoholism, environmental issues, the perfume industry and even survival in extreme conditions. The characters and relationships are at the forefront of this story. Pirio spends much of her time consumed with helping her friend Thomasina, and her son, Noah. Noah is the son of Thomasina and Ned, and Pirio has a strong connection with him as his Godmother. I really enjoyed the relationship between the two and the struggles they both faced dealing with Thomasina's alcholism. To add some complexity to the character, Pirio is involved in her family's perfume company and part of the story is related to her relationship with her father and his wife, and her memories of her mother who died when she was young. Elo gets into details about scents and the development of perfumes that was actually quite interesting and added a little diversity to the storyline. The mystery itself was engaging, and there were a few characters that interacted with Pirio that were potential "bad guys". It was hard to figure out who was on her side and who wasn't until closer to the end of the book. This kept the pages turning and added some suspense. This is much more of a suspenseful mystery than a complex thriller. It's focused on the characters and the story, and I really enjoyed it from start to finish. Connect with the author on her website, Twitter or Facebook. This review is based on a copy of North of Boston that I received from the publisher in exchange for an honest review.